Excellent way to round off a special year. APEX gaming won the BEGE award for ‘BEST JACKPOT CONCEPT – LAND-BASED GAMING’ during the Balkan Entertainment and Gaming Exhibition that took place between 21st and 22nd November in Sofia, Bulgaria. The BEGE awards play a leading role in the gaming industry as the Balkan Entertainment and Gaming Exhibition is the most significant show in Eastern Europe. Competition is strong and winning a BEGE award underlines true innovative prowess. The APEX gaming management team was this justly proud to accept this key award. This award indeedrecognises an abundance of features that make the CLOVER LINK Jackpot Editions unique. First and foremost, the CLOVER LINK games, combined with a powerful four-level jackpot have registered success throughout the world. The sheer choice – with three completely different designs available – enables casino operators to position these games to best fit their own particular needs. In addition to that, operators can choose between different Pinnacle gaming machines for each design. “After such a special G2E Las Vegas, we thought we had reach the pinnacle of our year. 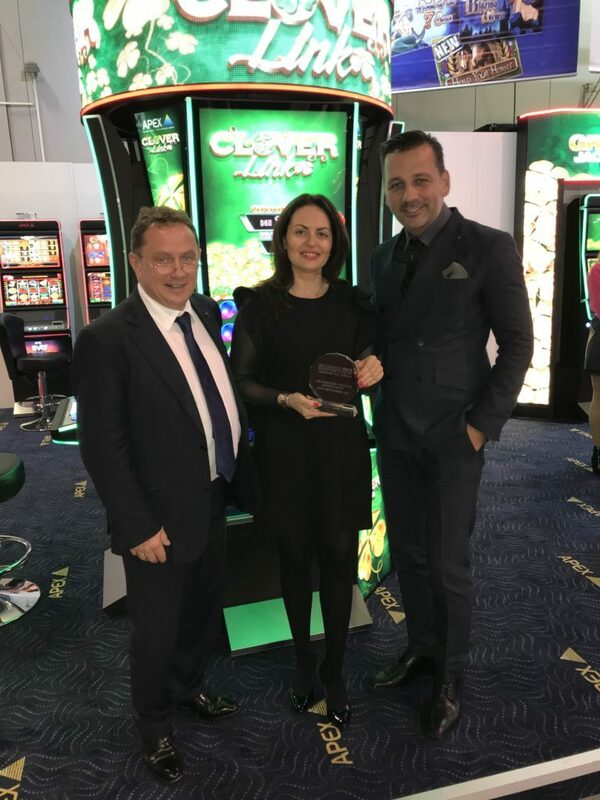 This BEGE award crowns a very special year for APEX gaming – the year that has put APEX gaming firmly on the global gaming map for complete jackpot island solutions”, stated Kubilay Özer, Global Sales Director at APEX gaming. Operators can determine between the WALL EDITION, the ROUND EDITION and the BIG ISLAND EDITION. Furthermore, each edition is available in a variety of slots – from Pinnacle gaming machines with three screens to the Pinnacle Curved with the gigantic 43” curved screen. There was plenty more to see on the APEX stand, including individual Pinnacle gaming machines, the Shuffle King 2 and brand-new Shuffle King 6 as well as many live gaming products – from the complete live table to individual live gaming solutions. “We live by our corporate philosophy to take gaming to the next level – bringing innovations that add-value for operators and bring new, higher levels of entertainment values for the players. This award shows that we are on the right track”, concluded Mr. Özer. Passport Technology pledges its support to the awards ceremony with a difference!